Well, almost. Ann has had to go “dahn sarf” for a few days, leaving Molly and Chas to look after M2L. But the rest of the gang who were here at Gailey last year through the ice and snow are here again. I had a mooch around the market at Penkridge this morning, picking up a few bits and pieces, then, after a bite to eat, we set off heading for Gailey. Filance Lock was just around the corner, then there was around a mile before we got to Otherton Lock. We caught up with another boat here, and it was here as well that we met George, Carol, Chas and the 2 Mollys, who’d walked down to meet us. George and Carol opening the lock gate, Chas on the right, M2L Molly chasing froth. I’d been instructed to stay on board, so had an unusual view of the inside of a lock chamber…..
Chas joined me on Seyella, Mags retired inside out of the wind and George and Carol walked to Rodbaston Lock. After this one we had a swap about, Carol took the tiller and Chas and I took the towpath. We pulled up behind Moore2Life and Rock’n’Roll just below the lock. This evening is a get together with George and Carol, and Chas to catch up with what we’ve all been doing. The odd glass may also be consumed…. That’s how we were when we arrived at Penkridge this lunchtime. The rain has since turned up as expected, but I’ve been up and done the shopping, so I’ve just got Meg to walk in a bit. Not that she’ll want to go far, she’s feeling a bit sorry for herself. Somehow she’s snagged her dew claw in her left fore, so it’s pretty tender. She’s done it before and it’s healed cleanly, but we’ll keep an eye on it for a few days. We got away at 09:30 this morning, so we could get here in the dry. Although windy it wasn’t too much of a problem, just the odd exposed stretch being “challenging”. Acton Trussell was passed on the left hand side, an old village noted in The Doomsday Book but now lost under new housing. It’s handy for commuters either north or south, with the M6 only a short distance away. ….and 13c St James’ church. Shutt Hill Lock appears after the village, the first of 4 for us today. Now crossing on the concrete bridge below the lock, the road from Acton Trussell to Penkridge originally went over just behind the lock chamber. The gate marks where the road ran, and you can see the tarmac behind it. Park Gate Lock comes next, with Midland Chandlers in a handy spot alongside. The lock is so called for the lane running into Teddesley Park. Although maybe not. We were just going under the M6 bridge when I took the picture…. Maybe he’s audialy challenged deaf. It was a bit breezy above Longford Lock…. but then got calmer as we entered Penkridge. Up Penkridge lock and we pulled onto the services for the usual emptying and filling, then moored up on the 48 hour VM a little further on, with a sense of deja-vous. Moored in Penkridge 29th November 2010. For whom it may concern – Mags has made a ginger cake today. It smells yummy. We didn’t quite get a frost last night, although the temperature dropped to 0.3° We woke to a cold grey morning, but at least the wind was still blowing elsewhere. Away at 10:00 we had around 40 minutes to cruise to Colwich Lock, but I had to pull over to liberate some logs against the towpath. A tree had blown down recently and been cut up where it lay. I wasn’t the first to take advantage of this bounty, all the easily portable bits had gone, leaving some large or long logs. Still, with a bit of determination (and a lot of grunting!) I got some good bits aboard. Just above the lock we had to arbitrate between 2 swans. The older of the pair was doing it’s level best to drown the other, holding it’s head under water and standing on it’s back. I imagine it was a territorial dispute. But whatever the reason we couldn’t just let it happen. So as we got alongside the pair I gave several sharp blasts on the horn, which startled the aggressor. Then I could sneak the boat between combatants, allowing the fledgling to climb onto the bank. I kept the older bird moving forward, getting behind him if he tried to turn back, and managed to herd him through the next bridge a ¼ mile away. It probably won’t keep them apart indefinitely, but at least the younger one had a chance to get his breath back! Little Haywood village is where we left the swan, and it was also home to JRR Tolkien’s wife, Edith. During his service at the front in WW I he contracted Trench Fever and returned to England to recuperate. He stayed here with Edith in a cottage on the Teddesley Park Estate. He was never well enough to return to the fighting, but instead spent the remainder of the war in various postings in England. Tolkien, in case you’re from Mars, wrote The Hobbit and Lord of the Rings. These are the most well known of his work, but he also wrote several children’s short stories and essays on other authors work. He retired from his final post of Professor of English Language and Literature at Merton College, Oxford in 1959, and died in 1973. Haywood Lock was our next landmark, followed by a left turn at the junction. In Haywood Lock, logs on the roof….. I couldn’t lift this one but I wasn’t going to leave it behind! Haywood Junction, we turned left onto the Staffordshire and Worcestershire Canal. It’s definitely out of season now, all of the Anglo Welsh hire fleet seem to be home. Tixall wide is a broad section of the canal, reputedly dug to make the canal appear more riverlike to a local landowner. It’s a popular spot for mooring, and even now there were several boats taking advantage of this pleasant spot. 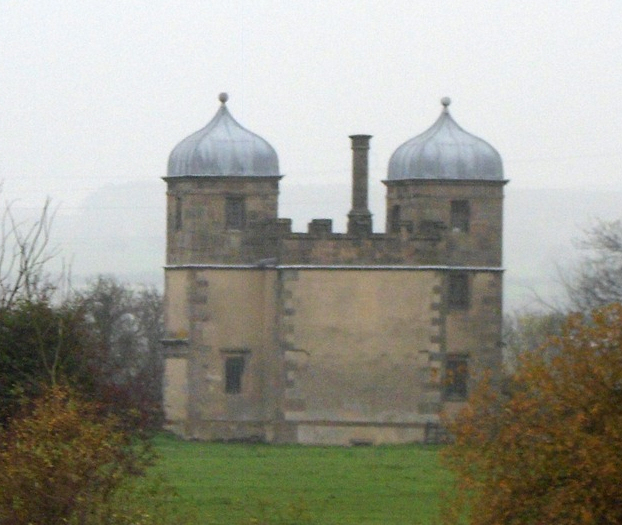 Sitting on the rising ground to the north is Tixall Gatehouse, all that remains of the Tixall Estate. The hall itself was demolished in 1929. Chas on NB Moore2Life commented that it’s very similar to Swarkestone Pavilion (right). The gatehouse was built around 1580, the pavilion in 1632. Both were built in the Jacobean style. It’s likely that the Harpurs of Swarkestone would have visited Tixall at some point, as both were important landowners. Maybe the gatehouse’s design influenced the Harpurs when they had the pavilion built. Incidentally, The Aston’s of Tixall were related to the Levetts of Wychnor Park, who I mentioned a few days ago. The very pretty Tixall Lock is a mile or so beyond the wide, then the canal does a dogleg as it crosses an aqueduct over the River Sow. The electrified West Coast Main Line can be seen across the field, just before it ducks into the tunnel under the end of the ridge. The canal does a loop around the high ground of Baswich and Weeping Cross, then heads south, leaving Stafford to the west. We’re now following the third of the river valleys we’ve used today. We followed The Trent to Great Haywood, then crossed it and followed The Sow till we started to head south, and now we’re following the River Penk. Near Baswich is a closed off junction where a short branch dropped from the canal to the River Sow. The river used to be navigable from here up into Stafford, but trade fell early in the 20c and the branch to the river became derelict in the ‘20s. The line of the branch has been infilled but is still visible. The Stafford Riverway Link aims to reinstate this connection, enabling boats to navigate into the town. Site of the Stafford Branch to the River Sow. The remains of the towpath bridge can be seen at either end of the weir. The day started to get colder as the wind got up, but at least we had a bit of weak sun, too. Our last lock of the day was at Deptmore, and was the deepest so far. We pulled in for the night just around the corner you can see ahead, and I set to slicing the wood up into rounds ready for splitting. I was just clearing up when these 2 chaps came paddling along…..
Not a sight you see every November….. They are in training for a Paddle Board competition on the Dutch canals. I think I’d stick to UK canals, the boats you’re likely to meet will be smaller! The last time we moored here we were bombed by acorns from the overhanging oaks, this time it was twigs and leaves blown across the canal from the trees on the other side! I went out with Meg at not long after 11:00 last night and they were creaking and groaning as the strong wind lashed them. We’ve no wood on the roof at the moment, but I wasn’t sure if that would still be the case in the morning! We had a bit of an unsettled night, regularly woken as a larger missile bounced off the roof. But this morning the wind had dropped a bit and it was bright and sunny. We moved off at around 10:00, and met another boat not far around the corner. We had to deal with the wind in our faces, the steerer on NB Blue Moon had the low sun in his. NB Blue Moon braving the wind and the sun. This was originally a short tunnel, then it was opened out due to subsidence. Since then realignment and widening of the A513 crossing above has just about reinstated it’s tunnel status. Coming out into daylight again, The Hawkesyard Estate is on the left. Hawkesyard Hall, with St Thomas’ Priory above and behind. The hall dates back to the 14c, but alterations and extensions in the 17c and 18c leave little of the original. The Priory was built in 1898 by Dominican monks who inherited the estate in 1894. The hall fell into disrepair when the monks left the estate, but has now been restored and is a conference and events venue, with a golf course. We filled up the water tank at the end of the long term moorings, then motored into Rugeley, stopping on the town moorings to visit Morrison’s for provisions. You know when you’re coming into Rugeley…. This coal-fired power station produces 1000 MW of electricity. Commissioned in 1972, it replaced the earlier, smaller Rugeley A. The fuel was supplied by conveyor directly from Lea Hall Colliery till it’s closure in 1990. Now coal comes in by rail. It gets through 1.6 million tonnes of the black stuff every year, leaving a ¼ million tonnes of ash to be disposed of. Although we’re in the Trent valley, we’ve not seen anything of the river since Alrewas. But just out of the town the canal crosses the river at Brindley Bank, and it remains close at hand all the way to Stoke on Trent. Trent Aqueduct at Brindley Bank. The brick bridge in the distance carries the newish Rugeley Bypass. We pulled over a little further on, near Taft Bridge. It’s a popular spot in the summer, but now it’s winter…..
Taft Bridge moorings, not a soul to be seen. The wind dropped quite suddenly this afternoon, so it’s still and peaceful now. With the clear skies the temperature is dropping as well. Good chance of a frost tonight. It was exactly 12 months ago that we broke ice to Penkridge after a night of -5°. It would be 10 days before we broke out, crunching and munching our way to Gailey to join up with NBs Rock’n’Roll and Moore2Life. Another 4 weeks passed before we were able to get going again, and even then we encountered some fairly thick patches of ice. We making the same trip again this year, only in temperatures considerably higher. I had a bit of shopping to do this morning, but we were still on the move by 10:00. The first lock today was just 20 minutes away. With another boat arriving at the top we were able to leave the top gates open, and we had the same sort of luck at most of them today. Another 20 minutes saw us at Hunts Lock, arguably the first of the Fradley locks. BW have the gear ready for Monday’s closure. Keepers Lock is next, just under the bridge arch in the distance. These 2 are due to close on Monday for a week, which is why we needed to be through this weekend. After Keepers we pulled in on the services to empty a loo and drop off a bag of rubbish. We’d filled up with water at Alrewas on Thursday, so didn’t have to use the very slow tap here. We can top up again near Armitage tomorrow. Coming up Fradley Locks, approaching Junction Lock. Two more locks, Middle and Shadehouse, and we were clear of Fradley. Woodend Lock is about 15 minutes on. Just behind me, as I took the picture, is where the proposed HS2 rail link will cross the canal. This was our last lock today. We motored gently through a very autumnal Ravenshaw Wood, and past Kings Bromley Wharf and Kings Bromley Marina. There are more leaves on the water than on the trees! The chimney indicates some sort of industrial use in the past, a trawl of the web found an old OS map with the site marked as “Creamery”. The wharf was built to service Edward’s Creamery, with coal coming in, presumably with raw milk from canalside farms, and pasteurised or processed milk products being shipped out. More info here. Incidently, this is the blog of FMC NB Minnow, moored in Fradley as we came through this morning. Have a look at the photo above. We pulled in a little further on, just before Bridge 55. It’s been a dry day, but breezy. Forecasted to stay much the same over the next few days. George and Carol, Chas and Ann, we’re planning on being at Penkridge on Tuesday afternoon so we can visit the Wednesday market, then we’ll be moving on to Gailey on Wednesday afternoon or Thursday morning. See you then. I don’t usually post twice in one day, but I just had to introduce you to this website. If you’re at a loose end, nothing to do, kids need amusing and fancy a challenge, go to http://canallife.co.uk/index.html. Still very new, I reckon it’s going to be very popular. We had a quiet day yesterday. I had a few jobs to do, topping up the batteries, filling the stern tube greaser, mopping out the bilge. Just everyday maintenance tasks. Meg and I had a long walk around the fishing ponds on the other side of the canal in the morning. It was a fine, sunny morning as we set off this morning, but alas it wasn’t to last. The cloud built up and a cool breeze started blowing soon after lunchtime. Still no rain though. Not sure if that’s a good thing or a bad thing, looking at the levels in the waterways. The old gravel pits which form the basis of Branston Water Park are a good foot down. Past the Water Park moorings. These have been set aside by BW for winter moorings. For a fee, you can moor for 4 months, from the end of October till March. Obviously some spots are more popular than others…. Don’t know what Meg has spotted…. In the garden of one of the cottages is a pair of plummer blocks straddling the bywash. These would have carried a rotating shaft or axle, bridging the stream. Maybe supporting a waterwheel at some time? Site of a small waterwheel perhaps? A closer look at the photo shows that they’re not bolted down. I guess just a bit of industrial garden furniture. We pushed on, alongside the busy A38, up Barnton and Wychnor Locks and upstream on the short but pretty river section below Alrewas. Wychnor is now just a couple of farms and a church, but used to be a bit larger. It was recorded in the Doomsday Book of 1087 as having 7 peasant families working the land, owned by Robert of Stafford. There was a mill and a manor house, neither of which remain, but there are indications of a large structure, presumably the manor, with adjacent fishponds, alongside the river south of the church. The outline would have been a defensive moat. A later 18c hall was built to the north and west of the village, by the Levett family of Lichfield. Substantially “improved” in the 19c, the Grade II listed hall is now a country club. We arrived at Alrewas Lock, to be waved into the chamber by an angler working off the lock landing. he opened the gates for us! Result! I reckon he didn’t want me pulling onto the landing and disturbing the fish…. We’d been leap-frogging a hire boat (NB Henry IV) since Barton, and there was no-one coming down, so I opened a paddle to empty the lock ready for them. We pulled onto the water point a couple of hundred yards on, and I saw the angler open up the lock for the hire boat too. Result number 2! We pulled off the water point and followed Henry IV into Alrewas, but they pulled onto the nearest moorings while we toddled on, up Bagnall Lock on the other side of the village and moored just past the road bridge. 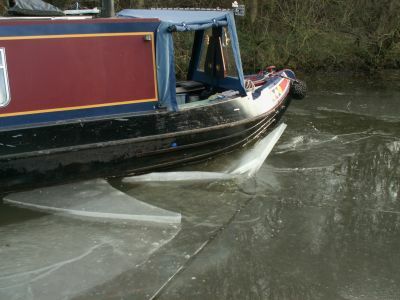 I’m going for a run up to Fradley and back in the morning to check out the mooring situation. If there’s space we’ll move up there, ready for getting through the repaired locks higher up, due to re-open in the afternoon. Had a phone call at around 4 this afternoon, from George and Carol (NB Rock’n’Roll) wondering where we were and how soon we’d catch them up at Gailey. They’d Chas and Ann aboard (NB Moore2Life) and it sounded like they’d made an early start on the vino! We’ll have to get a move on if they’ve started the Christmas parties already! We had a quiet night at Shobnall Fields. I’d decided to go for a run this morning, so guess what, after all the dry weather it was raining. Still, a bit of water never hurt anyone, eh. I enjoyed it, it’s the first run I’ve had since the Worksop ½ marathon at Hallowe’en. But it’s surprising how fast your fitness falls away. Five miles at a fairly good pace felt quite hard. It was good to get the muscles going again, though. We got away at around 11:00, first stop just ½ a mile on at Shobnall Boat Services. Here we filled up with diesel, bought oil and filters for the next engine service, and topped up with other consumables like toilet fluid. We’re just leaving after reversing in to fill up. The bridge number, 1, relates to the Bond End Canal, this being the first bridge on that canal. From here it was just an hour to Branston and our stop for today. One lock to ascend, Branston Lock, before the mooring. 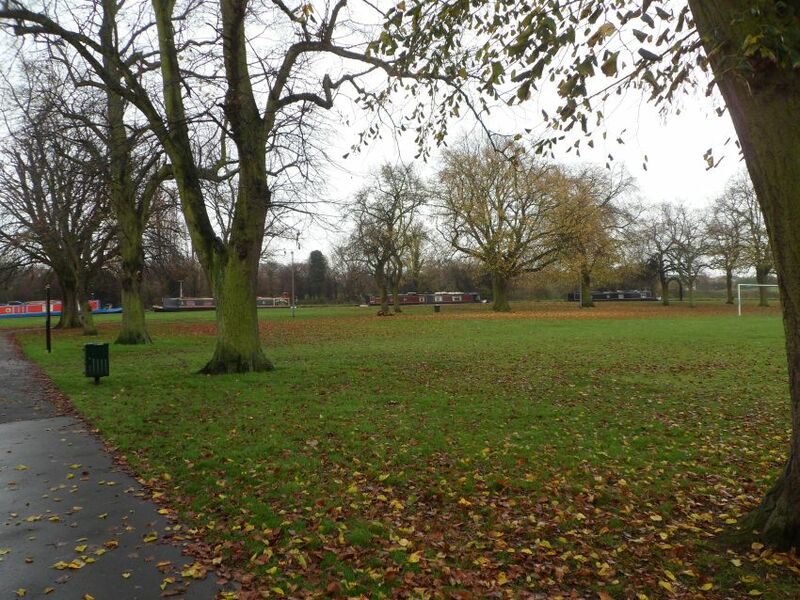 Another good spot for playing ball….